Jordan Tucker brings the ball up the court. Tucker scored a career-high 24 points in the win. Photo by Jimmy Lafakis. 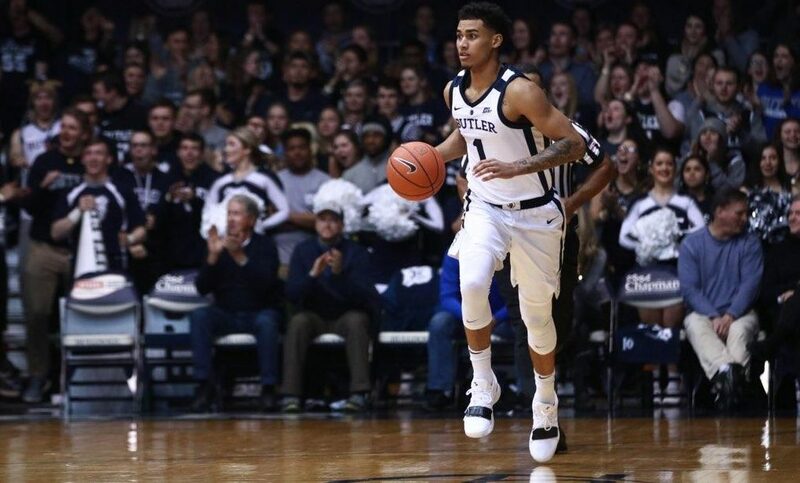 The Butler men’s basketball team picked up its second win in a row with a 80-71 victory over St. John’s in Hinkle Fieldhouse. Butler only trailed for 20 seconds and is now 3-3 in Big East play. Here are three takeaways from an incredibly encouraging win. 1. It all starts with defense and rebounding. Butler held DePaul to 41 percent shooting and won the rebounding battle by seven. The Bulldogs assisted on 51 percent of their field goals and scored 87 points. St. John’s shot 32 percent in the first half and 38 percent for the game. Butler outrebounded the Red Storm 40-36, hit 46 percent of its shots and scored 80 points. For a team like the Bulldogs who struggles to create quality looks in the half court, turning defensive stops into transition opportunities before the defense can get set is absolutely crucial. Butler’s offensive is most effective when its playmakers, particularly Kamar Baldwin, are grabbing defensive rebounds. Baldwin posted a career-high 14 boards in the win over DePaul and pulled down another eight against the Red Storm. The Bulldogs have looked like a completely different team as a result. Butler was outrebounded by at least seven in its one-point road losses to Seton Hall and Xavier. If the Bulldogs continue to rebound the ball like this, they win games like those in the future. 2. Jordan Tucker has arrived. As well as Baldwin played — and he was nothing short of special on both ends of the floor — the most important development in this game was Jordan Tucker scoring a career-high 24 points in 32 minutes while shooting 8-of-17 from the field and 55 percent from three. He hit six 3-pointers but also made two 2-point field goals, something he’s really struggled with so far. It was no secret Tucker could really shoot. His all-around scoring ability and comfort level handling the ball have been pleasant surprises. In his last two games, Tucker’s scored 43 points, hit 11 threes and is 15-of-31 from the floor. He’s also already improved immensely on defense and figures to only get better as the season progresses. His presence absolutely changes the potential of this team. It’s also not a coincidence that Baldwin’s shot over 55 percent in each of the last two games. With another player capable of creating his own shot on the floor, Baldwin no longer has to force things. He can let the game come to him, which is when he’s at his best. The Bulldogs stepped up with the pressure mounting, but their work is far from over. Butler hosts the two teams at the top of the Big East standings — Villanova and Marquette — in its next two home games with a trip to Creighton in between. Losses in all three of those games is a realistic possibility, but it depends on what Butler team shows up. There are also some real concerns worth pointing out, most notably the free throw line. The Bulldogs made four trips against DePaul and seven in the first 37 minutes of this game. The Blue Demons and Red Storm visited the charity stripe a combined 36 times. Butler is still a rather one-dimensional team that needs to shoot the ball well to win. Getting to the free throw line provides an alternative source of offense when points are hard to come by. The Bulldogs need to start taking advantage of it on a more regular basis. At the end of the day, there’s no denying Butler’s been excellent the past two games. That being said, these performances aren’t going to matter if the Bulldogs can’t play at a high level consistently.